Project SAI AVANUE is strategically placed off Porur. 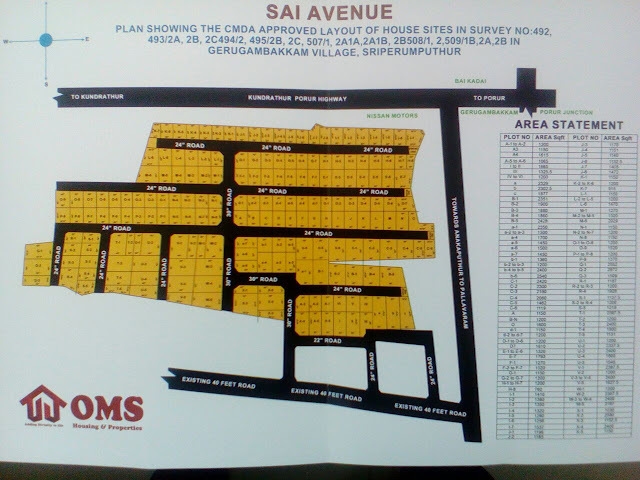 Sai Nagar is a gated community, With 13 acres this is the biggest CMDA Approved project in Porur, Chennai. Totally 197 plots where 150 plots sold out already. North, East, West, South all faces available and with different sizes. Sizes starts from 1,200 square Feet. With a proper Dimensions. · Prime Location Arjun Garden Gerugambakkam.
. From 10 min drive Porur Junction.
. From 1O min drive DLF IT PARK. · 1 km from Omega International School. · 3 kms from MADHA MEDICAL COLLEGE, KRISH INTERNATION SCHOOL. · 4 kms from DLF, L&T park. · 5 kms from Porur junction. · 9 kms Chennai Airport. · 8 kms from Tambaram Mepz backside entrance. The Kundrathur road connects with the temple town of Kundrathur. 24 hours buses and Share auto services operate between Porur and Kundrathur.Everuy 10min one bus available to 88K (Kundrathur to Broadway) , 88C, 88D (Kundrathur to Saidapet), 566(Kundrathur to Tambaram) and M88 (Kundrathur to Vadapalani). Alandur from - 11 km. Ashock Nagar from -13 km. Vadapalani from - 11.2 km. Porur is a part of the city of Chennai, Tamil Nadu, India. It occupies a crucial position on the mount-Ponnamalle Road. Porur junction is busiest junction in chennai, Which ensures a development in this surrounding area in both residential and commercial zones.. Schools,Colleges,Industries,It hubs, Chennai trade centre, Film industries,Etc..
With three IT SEZs(Special Economic Zones) coming up in Porur it is becoming a major IT hub of Chennai next.